The promise I made when I started this series last summer, was that I would share the ups and downs. Well, the past few months have been tough. I knew the holidays would be nearly impossible to stay on track food wise, and in retrospect, I managed okay. Maintaining weight was my goal and it was achieved. Over the past month I was beating myself up about what I have not been doing or how I was not following the steps I knew worked for me all Fall. This week I stopped looking back and made a very conscious decision to move on...move forward....looking at what I am doing right and trying to add more positive changes to keep moving forward. Joining the gym was a barrier that was overcome this week. Even when the day started off with a flooded storage room and getting my monthly cramps knocking me down, I considered using them as excuses, but didn't. I showed up. I showed up! 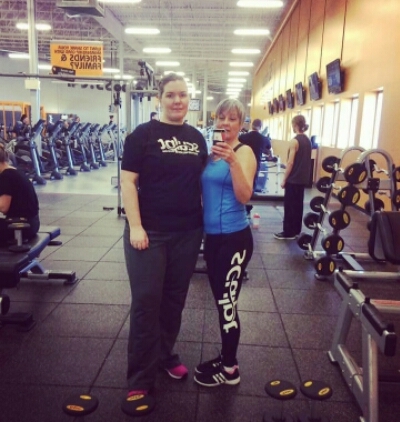 Michelle met me at the gym and set me up with a 3 day strength training workout. We did chest and back exercises and she showed me the other machines to complete the reminder of the exercises on other days. While we were there, I cringed at my full length reflection in the mirror. Right away Michelle encouraged me to always look at myself and even if I do not like what I see, remember that I love myself, which 99% of the time i do. She also added that I am there, at the gym, doing something about the reflection I cringed at. In general I am happy with me, but as every person in the world, I have my moments of doubt. It is not always what looks back in my reflection, sometimes it is unexplained anxiety, other times it is feeling like a failure as a parent or wife, we all have those moments. The key to moving past these feelings is doing something about it and realizing that my expectations are sometimes unrealistic. One step in the right direction is worth so much more than dwelling on the past or beating myself up about why I should know better. Today I was supposed to go back to the gym, but Clayton was with me all day and will be at the sitter tomorrow, as tomorrow I am off to a blogger's networking and learning day in Halifax. I knew I would not get there tonight as we had running kids around on the agenda. So this morning I hauled out my 10lb dumbells and did my arm exercises and a few ab exercises thrown in for good measure. So, I am feeling more positive and energized this week. In addition to exercise, I am now following a custom program for clean eating from Sculpt Health and Wellness Riverview. It is based on my likes and exercise level, to help me stick to itand see results. Moving forward i will be posting each week, not only to share with you, but also to keep me accountable. I trulybelieve in being honest in this journey, and it is not all losing pounds and happy days. It is hard work, and breaking bad habits is never easy. Are you struggling with weight, physical limitations, or anxieties that keep dragging you back to those bad habits? Check out my Facebook group for motivation and support, or feel free to share here in the comments.